The TOMO anthology, about which I posted earlier (click here), has finally been released, and my personal copy was delivered to me today! How I love the smell of new books! 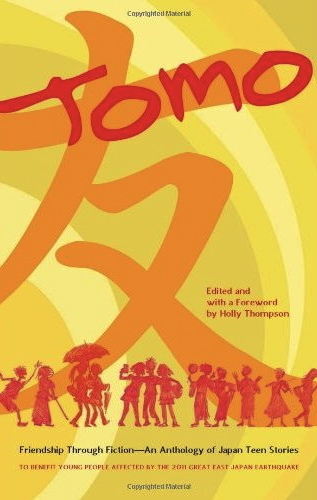 This one is chock full of Japan-related stories targeted to teen readers, and a quick look through the table of contents reveals a wide variety of themes and styles, including poetry and comic strips. The first story I read had me sobbing, and it's been a looooong time since I was a teen. 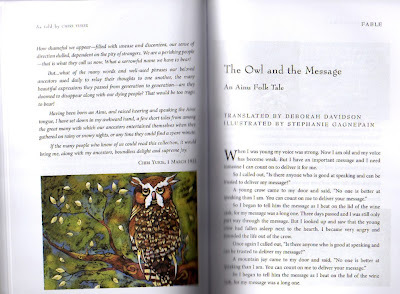 TOMO is relevant to Project Uepeker in that it includes my English translation of "Shirokani pe ran ran pishkan: The Song Sung by the Owl God," the first yukar in Chiri Yukie's yukar anthology. 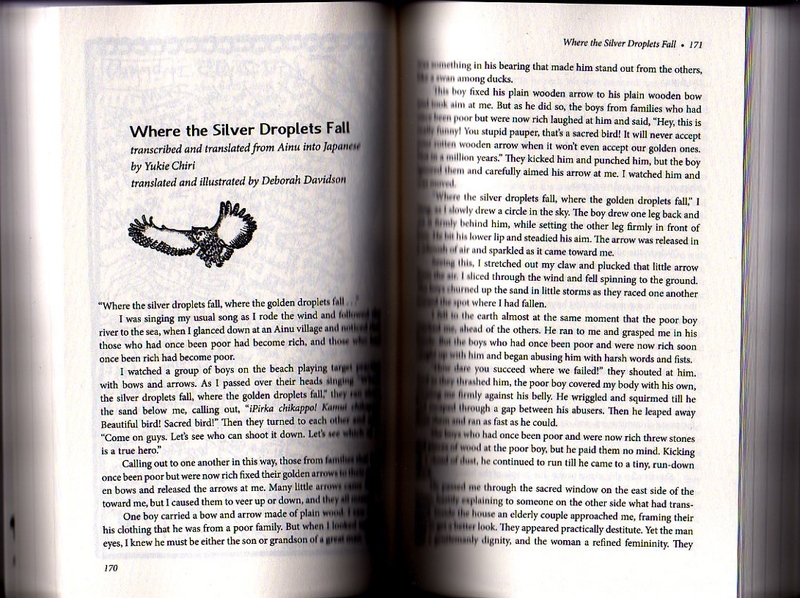 The title of the English version of the story is Where the Silver Droplets Fall, and it was chosen for inclusion in TOMO because it tells the story of how one boy and his family maintain their dignity and morals during times of tribulation. The full title of the book is TOMO Friendship Through Fiction--An Anthology of Japan Teen Stories. It it the brainchild of Holly Thompson (ed.) and published by Stone Bridge Press "in memory of all those lost in the Great East Japan Earthquake and Tsunami of March 11, 2011, and dedicated to all the young people of Tohoku." Proceeds from sales will go to benefit recovery efforts. For details, go to the TOMO blog. Also see the Japan Times review of the book. 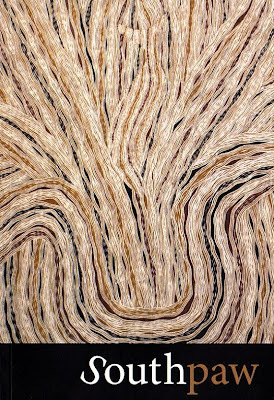 Southpaw, a literary journal out of Melbourne, Australia, and identifying itself as "a journal of writing from the global south," made its long-awaited debut a few months ago. 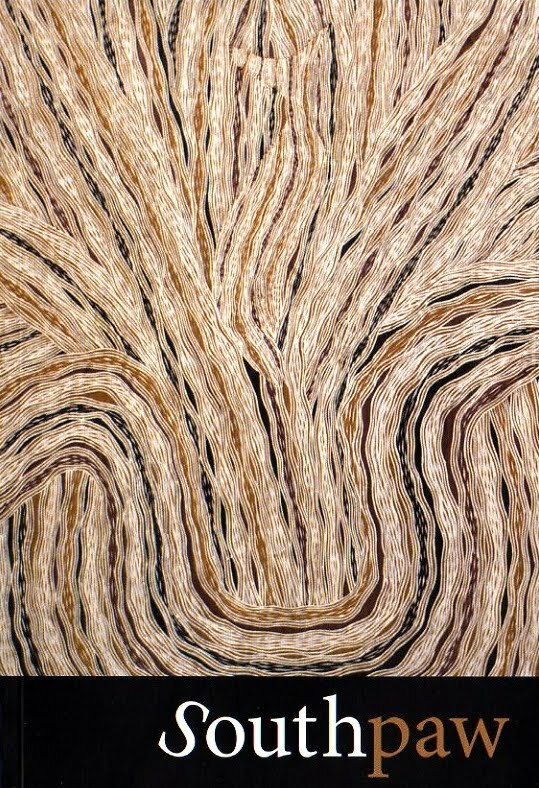 The theme of Issue #1 is Displacement. Displacement comes in many forms, but the one that immediately comes to mind in the context of Project Uepeker, is the tragic situation of the Ainu people being marginalized in their own native land. 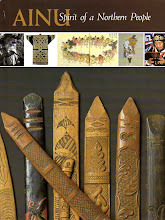 So I was very pleased when I was asked to submit one of my Ainu yukar translations for this first significant issue. 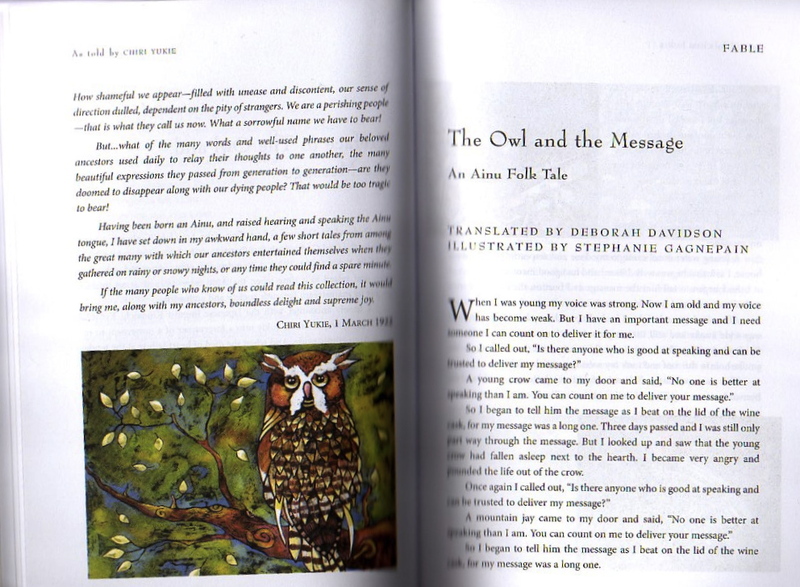 The yukar chosen for the purpose is the one I've titled The Owl and the Message, an illustrated retelling of "Konkuwa: A Song Sung by the Owl God," one of the yukar included in Chiri Yukie's anthology. Send an email to submissions@southpawjournal.com to inquire about purchasing copies of Southpaw Issue #1 or for institutional subscriptions. My yukar translation Where the Silver Droplets Fall has been included in the TOMO anthology, a collection of Japan-related short stories scheduled to be released from Stone Bridge Press in March 2012. Proceeds of the book have been committed to the support of teen victims of the March 2011 disasters in Japan. You can read more about TOMO here. In connection with the upcoming release of TOMO, the Japan chapter of the Society for Children's Book Writers and Illustrators (SCBWI) asked me to write an article about Chiri Yukie to go into the winter 2012 issue of their newsletter Carp Tales. 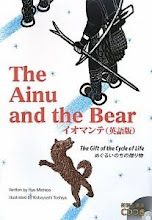 It was my (figurative) encounter with this remarkable Ainu girl that first ignited my interest in Ainu yukar and moved me to make them more accessible to the English-speaking world. 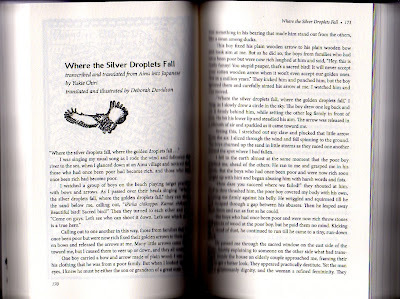 Where the Silver Droplets Fall is my English translation of a yukar that Yukie first transcribed from the Ainu language (which had no writing system), and then translated into beautiful, literary Japanese. 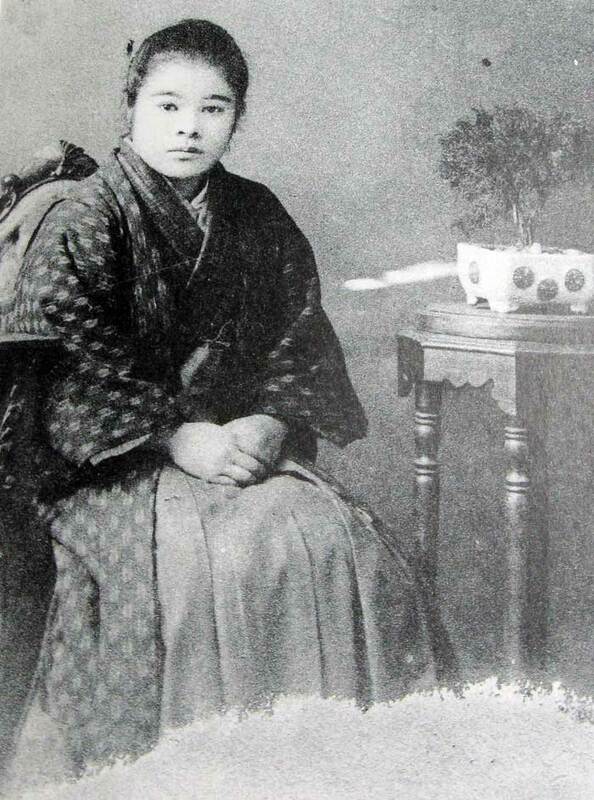 In times when the Ainu themselves no longer valued their indigenous language and culture, linguistically gifted Yukie made enormous personal sacrifices to preserve a collection of Ainu yukar, all before she died at the tender age of nineteen. 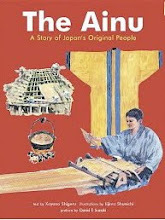 Anyone with an interest in the Ainu owes it to himself/herself to learn about Chiri Yukie. I urge you to download the aforementioned issue of Carp Tales (pdf file) and read the article for yourself. Paper Tigers Blog is the blog branch of Paper Tigers.org, a website about multicultural books in English for young readers, focusing primarily on the Pacific Rim and South Asia. Recently an article on the Ainu oral tradition was posted on the blog, in which credit is given to Project Uepeker for some of the information in the post. 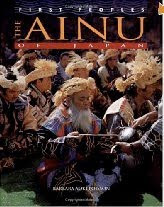 I have been thrilled in recent years to observe the gradual spreading of awareness about the Ainu among ordinary (i.e. non-academic) people with a healthy curiosity about the world we live in and a respect for unfamiliar cultures. Blogs have played a huge role in this spreading awareness, and that's one of the reasons I enjoy discovering new ones and introducing them here. I was particularly delighted to discover Paper Tigers because it shares my own enthusiasm for storytelling traditions and a commitment to support the preservation of such traditions in the form of books for young readers. Paper Tigers was chosen by the American Library Association as one of the "Great Web Sites" for Teachers, Librarians and Parents. Do check them out! TOMO, an anthology of short stories with particular relevance to teens, will be released this coming March from Stone Bridge Press. Its aim is to bring Japanese stories to readers worldwide, and in doing so, to help support young people affected or displaced by the March 11, 2011 Japan earthquake and tsunami. Proceeds from the sales of this book will go directly toward long-term relief efforts for teens in northeast Japan, the area most affected by the disasters. 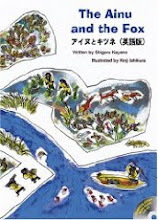 My translation of the Ainu folktale, "Where the Silver Droplets Fall," accompanied by two simple etegami-style drawings, is included in this book. As one of the contributors to the anthology, I was interviewed on the TOMO blog. In the interview, I share a bit of my personal background and what led to my becoming a translator of Ainu folklore. But more importantly, it gives a glimpse into the life of Chiri Yukie, an Ainu teenager who struggled to value herself and her cultural heritage, at a time when both were despised by mainstream society. By the time she died of heart failure at the tender age of nineteen, she had become a forerunner of a movement to save her people's oral tradition from oblivion. Click here to read the interview. I stumbled across some great photos on Kenji Dubois Lee's weblog that are the next best thing to actually visiting the Ainu Culture Promotion Center in Sapporo. 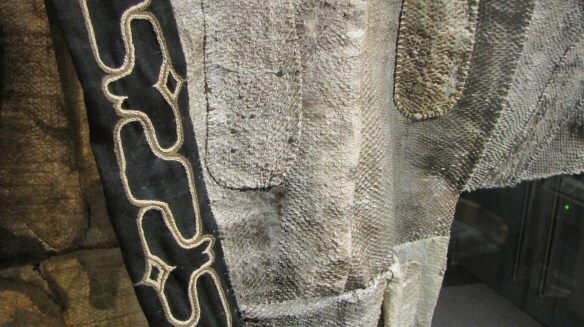 Some great close-ups, too, like the attached photo showing a robe made from salmon skins. Please take a look at the original blog post. Thanks, Kenji, for sharing these with us! Quite frankly, this is a book I wish I had written. The scholar who has this honor, however, is Sarah M. Strong, professor of Japanese at Bates College in Lewiston, Maine, and I am sincerely happy that a book covering the life and work of Chiri Yukie with such thoroughness and depth is finally in print. The Preface can be downloaded as a PDF file from this page. Click here for a detailed description and reviews of the book. 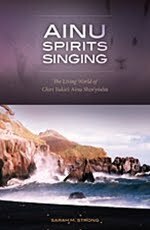 It was released just this month from University of Hawai'i Press, and can be ordered from the aforementioned link or from Amazon US.